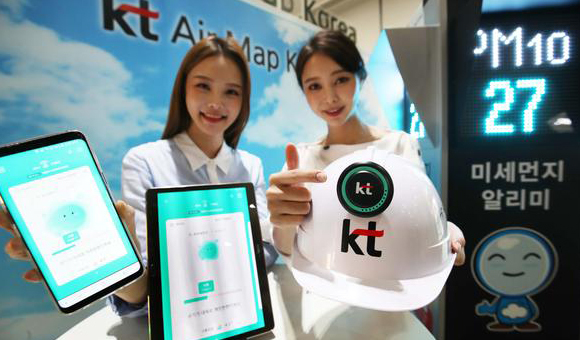 South Korea`s KT Corp. said Monday it has launched a real-time air quality monitoring application dubbed Air Map Korea to provide fast and accurate information on fine dust across the country and prevent damages. The namesake program is part of the company’s social responsibility initiatives to support government policy to fight fine dust through its IoT solutions and big data analytics. The new app provides real-time information on fine-dust levels depending on the location of users and suggests useful tips for daily activities such as laundry, exercise and car washing and informs safe routes to work, school or for strolls. Such data will also be provided through olleh TV and voice assistant GiGA Genie. KT has established about 2,000 air quality monitoring stations across the nation, and tightened the distance between monitoring stations to about 1 kilometer in Seoul to measure air quality more correctly. The company plans to add 500 monitoring stations and 7,000 mobile sensors to complete a nationwide monitoring network. KT said data collected from its stations showed fine-dust levels varied by up to two times between regions in Seoul on January 11, when high-density fine dust hit the peninsula.